WEARING ONE OF MY MOST RECENT PURCHASES. THE ASOS CURVE VINTAGE INSPIRED PLAYSUIT. I LOVE IT! VERY COMFY AND THE BACK IS FABULOUS! I AM VERY CONSERVATIVE WHEN IT COMES TO SHOWING SKIN!! FOR PERSONAL COMFORT I DON'T EVER SHOW MY ARMS , BACK OR THIGHS. BUT YOU KNOW WHAT? THE OLDER I GET THE MORE I AM GETTING OVER IT!! I DECIDED TO WEAR NAVY (HUE BRAND) TIGHTS, POUR LA VICTOIRE PLATFORM SANDALS AND A VINTAGE STRAW CLUTCH THAT I THRIFTED. THE BACK HAS A HUGE OPENING THAT I JUST COULD NOT SHOW BARE BECAUSE OF MY FULL CHEST I NEED TO WEAR A BRA WITH SUPPORT SO I WORE A ROSE COLORED CAMI UNDER IT. Your legs are to DIE for! Work mami! Very cute outfit! The playsuit, navy blue tights, brown(?) shoes. Nice! You better WERK!! 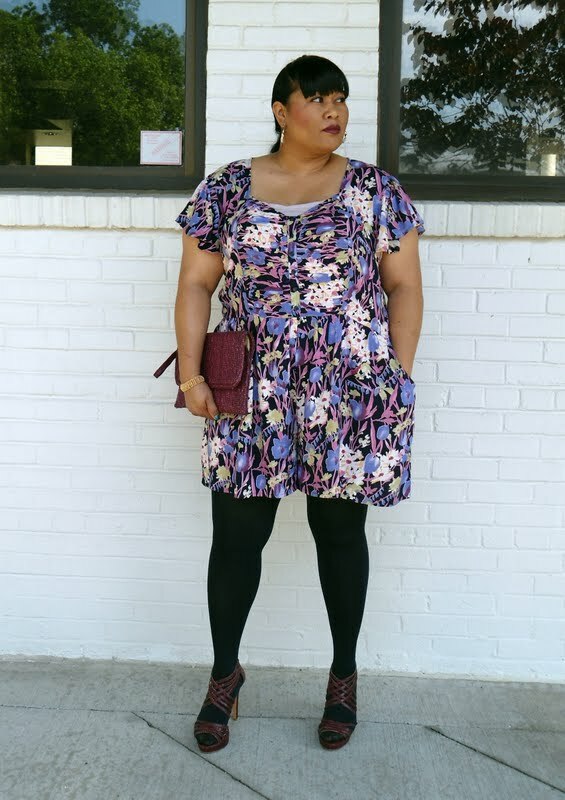 Loving the floral print and shoes are fab too! Ooh I almost bought this, but I decided to stop shopping online so much since I need to save money to move. It looks great on you, I hope it's still around when I can shop again! Kiah, I like that lipstick color on you a lot! Hello Lady! I love, love, love this look! I like the match with those sandals. can I borrow the clutch?? omg i love that lipstick and that print!!!! oh I seriously decided today that I was going to order this tonight!! It looks so funky and fun and now that I have seen in on someone real, I WANT IT! What size did you get? Is it stretchy??? great shoes and i love the jumpsuit. you look wonderful! Love how you styled this outfit, looking good and we won't even go there with the shoes, HAUTE!! Lol! Loving the jumpsuit!!! At first glance, I did think it was vintage!Those heels are amazing too. Kiah that jumpsuit looks great on you. I might just have to gone ahead and order it! Cute cute cute! That jumpsuit looks so amazing on you! You have amazing legs as well! I also love the tip for wearing open back ensembles with a bra. I will have to do the same as well, as i have a large bust. i love this look Kiah, you look great! I wish ASOS had that in my size too cute! and I love those heels. pretty dress and looks great on you!! OMG Girl, thank you for stopping by and leaving all those wonderful comments. You had me cracking up with the movie situation. People can be so GHETTO sometimes, it kills me!! I am loving this outfit and will now stalk through the rest of your pics! Love it! Love those shoes! 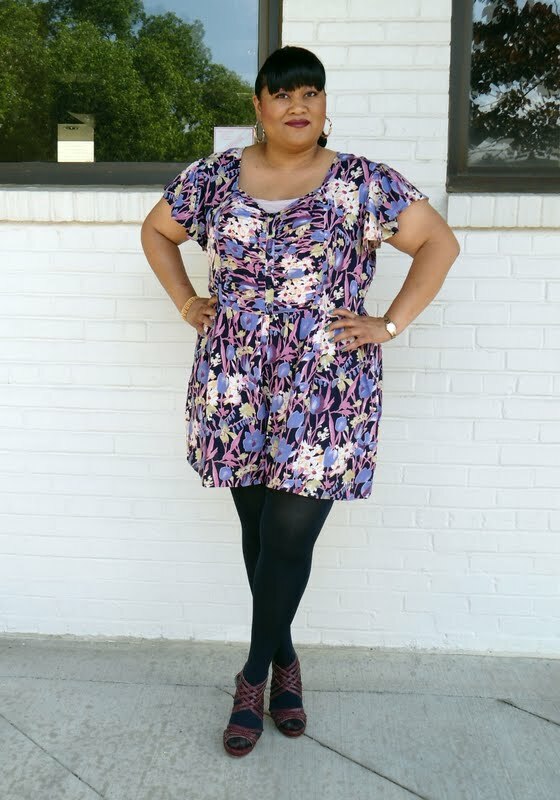 Beautiful dress, such a fantastic print. You look gorgeous. this is one of my favorite looks on you!! i must say, your hair looks FABULOUS in this style! I'm doing inspiration monday at two birds and a couple of weeks ago the look we were copying was a romper/playsuit look. You would have nailed it in this. Very cute. You look gorgeous! The floral print jumper and clutch are perfect. I wish they had that in my size when I made my purchase online too. p.s. I hope your having a spectacular Wednesday!!!! I wanted to let you know I award you the adorable blog award because your blog is fabulous. Daaaaang, you look gorgeous and fierce! I really love this whole look! I wish I had your legs, I have short, stumpy legs. Not to mention my thighs! I totally understand your preference of covering up certain parts, I'm the same way. Sorry for not commenting lately, I've been super busy. Just caught up on your posts! Lots of love! Girl I love this on you and those shoes are pretty! Cute outfit. Love the printed romper...I really need to incorporate more patterns in my wardrobe. your legs look awesome in those heels love that romper! the burgundy makes for a great contrast honey! Love the back and pattern sweetie! You have a new follower, and we would be very grateful if you visit, comment and if you like it, follow us! I really love this whole look on you! And oh em gee, your legs are amazing!!!! (like everyone has ALREADY pointed out!) I am a sucker for playsuits, but I usually wear them around the house or feel like a kid wearing them... maybe the key is HEELS! love the look!!! you look so pretty!! um...literally my heart skipped a tiny beat when i saw the back of this play suit. you are so amazing in everything you wear kiah. would you notice if i stole that clutch out of your closet though? Your legs are KILLER. I'm super jealous of tall chicks. They are always blessed with the hottest legs. Annnnddd I love this outfit. You look fierce. This has to be one of my favorite outfits of yours!! You are definitely workin' it! Hot legs!!!! That play-suit is fierce on you. I love how your proving everyone wrong! 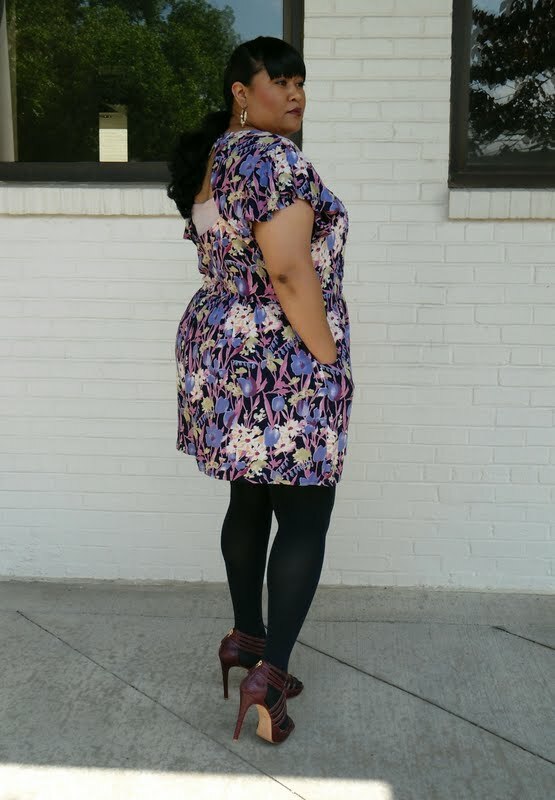 You can by curvy and still rock the latest trends. I can't wait to see you in Vogue Italia!!!! That playsuit looks great on you. Ilove the shoes with it too. The pattern on your dress is great, so pretty and colourful! Wow..you look awesome in that playsuit, and those shoes are killer. Wish I could rock heels like that.